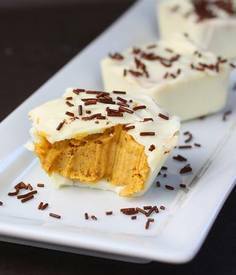 White chocolate pumpkin pie cups! Happy National White Chocolate Day! Filled with pumpkin, pumpkin pie spices, crushed graham crackers (you can make your own here) and a dose of cream cheese for good measure, the cups are sweet yet ever so slightly spicy and with a touch of creaminess from the cream cheese and white chocolate. The warm flavors of fall are all wrapped up in the hard white chocolate shell, making stopping at just two (or three...) not an easy feat. Don't forget- if you are taking these with you somewhere, temper your chocolate and they will not only be delicious, but pretty too!